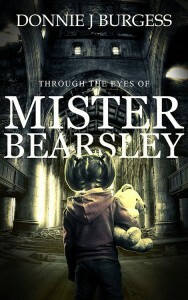 Through the Eyes of Mister Bearsley is my current project. Here you see the projected cover art. The little girl is Sarah and her trusted friend is Mister Bearsley. Look for this one in early 2016. And because I am such a tease, scroll down for a bit from fairly early in the book. Which, of course, won’t make a whole lot of sense out of context… Why would I do that to you? The hallway was long and narrow with doorways leading off from either side every ten or fifteen feet. It seemed very dingy. The pale yellow paint had not been refreshed in a very long time and the dust had collected in huge splotches over the years. There were lights hanging down from the ceiling between each of the doorways, but the light they cast was yellowish and only added to the dreariness. The floor was covered in linoleum with a floral pattern which was also dark and stained with age. At the far end of the hallway was a windowed door with a bright light shining through. This was not the type of hallway where one would expect to find an unaccompanied child, yet there Sarah was. As she stood looking down the hallway, she clutched Mister Bearsley tightly to her chest. She was very scared. “I don’t want to go down there, Mister Bearsley.” Sarah said. Don’t worry, Sarah, I’ll protect you. “Okay.” Sarah said, as she took her first tentative step down the hallway. She turned Mister Bearsley around so that he was also facing down the hallway and held him against her body with both arms. From the doorways to the sides, she could hear sounds that she couldn’t identify: hissing sounds, whirring sounds, popping sounds. These doors had no windows, but she could see pale lights coming from under them. People were in there making those noises. They could be bad people. Yes, Sarah, if you want to know. Sarah took a deep breath before she started walking again. She tried her best to ignore the sounds which were coming from the rooms to the sides. The noises would grow louder as she neared the doors only to fade once she had passed them. After she had passed the third such set of doors, she began to hear a different noise: a piano. The song that she was hearing was Beethoven’s Moonlight Sonata, but her young ear only recognized it as sad music. It’s okay, Sarah, keep going. Knowing that Mister Bearsley wasn’t going to allow her to stop, Sarah began walking more purposefully. Very slowly, very deliberately. By the time she reached the next set of doors, she was no longer able to hear the disjointed noises at all, only the sound of the sad music coming from the final door. She had to fight against her fear to continue her journey. When she reached the door, she could see motion inside. There was a light in the room which was casting shadows on the window in an eerie silhouette. As shadows will do, they didn’t appear to be moving in a natural way. Sarah was very afraid. She wanted to turn and run back down the hallway. It will be okay, Sarah. Just open the door. Sarah swallowed hard and reached out for the doorknob. It spherical, brass knob which felt icy to her touch. The unexpected cold caused her to flinch and jerk her hand away when she first touched it. She paused for a moment, gathered her courage, and reached for it again. This time she turned it immediately, hoping to ignore the icy cold. As the latch released, she slowly pushed the door open. There was a very loud and slow creaking sound from the hinges as she did so. Sarah ignored the sound of the hinges and pushed the door further, trying to see whoever was inside the room before they had a chance to see her. There was nothing on the right side of the room except another drab wall. She had to push the door most of the way open to be able to see anything else. She saw the woman first. She was facing away from Sarah and hadn’t noticed the door open. The woman had long, gray hair, held back in a ponytail which was draping down over her long white lab coat. She had surgical gloves on her hands, one of which was holding a brush. The woman was leaned over slightly, working on something on the table in front of her. Sarah stepped into the room behind the mysterious woman. She wasn’t tall enough to see what she was working on, but the woman’s hand was moving the brush about like an artist working on a canvas: a little spot here, a little sweep there. Sarah stood up on her tippy-toes to see what was on the table. Sarah had never seen a body before, but she knew immediately that she was looking at one now. The color wasn’t right for someone that was alive. But as the woman continued working away with her brushes, it only seemed to make it worse. No longer too pale, but somehow worse. The cheeks too bright a red instead of a normal fleshy color; the face a different color than the rest of the body. Sarah found it positively horrifying. Yet she couldn’t look away.